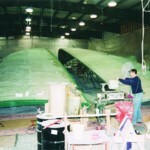 Eric Goetz (Goetz Composites) completed a 165′ structure they call The Ark. This striking wooden craft will never touch the water. Instead it will hang inside the headquarters of the America Yazaki Corporation in Canton, Michigan. The Japanese company is the largest supplier of automotive parts in the world. The structure, officially named the AY-21 Project, will be suspended from a steel structure between Yazaki’s manufacturing and office buildings. It will house a technical library in an atrium. Its bottom will be at the second-floor level, and the deck of the boat at the fourth floor. A third floor walkway, connecting the two buildings, will pass through the side of the 47′ wide ark. The ark is 17’6″ high. Boomer Construction, a steel fabricator from Detroit, recommended Goetz do the project. Boomer is doing the steel work for the project’s primary contractor, Shimizu Construction Company. Boomer chose to collaborate with Goetz because they have an excellent reputation for fabricating large, unique composite structures. Boomer’s steel structure must keep the ark aloft, so it was important to them that the ark be built light. Goetz made the ark with a 2″ balsa core, E-glass skins and WEST SYSTEM® epoxy. 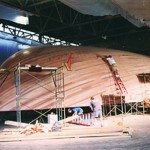 At 22,000 lb., it will be a much lighter structure than if it had been built with conventional boatbuilding techniques. More traditional construction methods would have required a construction crew on site and taken up to five months to complete. Instead, Goetz made the ark in eight pieces in their Bristol, Rhode Island shop. From there, they were moved to a rented facility near Fall River, Mass., where the ark was assembled and the surface was planked with 10,000 square feet of tongue-and-groove mahogany. 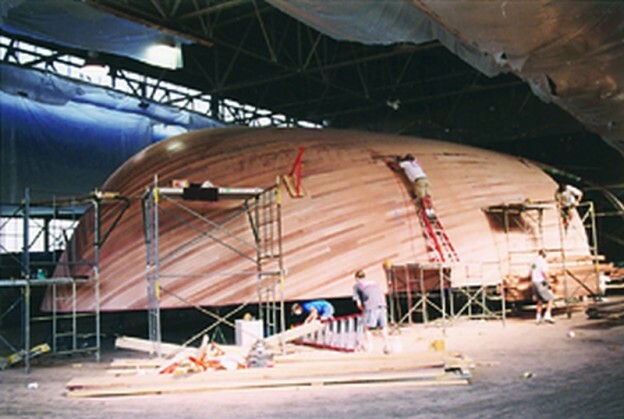 After varnishing the mahogany to a satin finish, the pieces were taken apart again and shipped to the Yazaki headquarters building site in Canton, Michigan. Fairing the mahogany skin of the ark. The eight balsa cored sections were assembled and the surface was planked with tongue-and-groove mahogany. 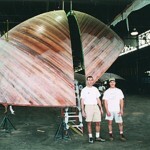 Eric Goetz and one of his crew in front of the partially disassembled ark. The cored sections of the ark before assembly and stripping. This entry was posted in Arts & Crafts, Weird & Wonderful, Yacht & Large Vessel Construction and tagged #12, ark, Epoxyworks #12, Fall 1998, Goetz Composites, Yakazi on August 10, 2014 by ewadmin.